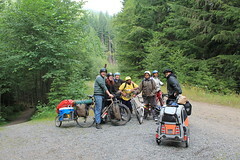 The folks at the Oregon tourism department came up with a great idea a few years ago when they developed the first of 12 Oregon Scenic Bikeways. It may not be as obvious as the bicycling surge in urban areas, but bicycle tourism is on the rise. There’s increased interest in all types of bike travel, from sub 24-hour overnighters to long self-supported trips, luxury to budget tours, mass bike rides to small tours. Retirement is a time when many active adults finally get the opportunity to spend more time on their bicycles, even taking an organized bike tour or two every summer.